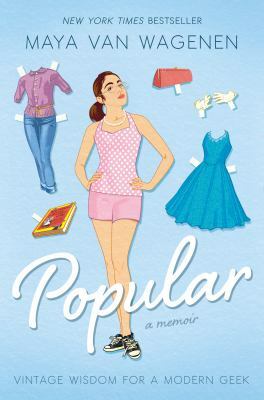 Maya was given a copy of Betty Cornell’s 1951 masterpiece: Betty Cornell’s Teen-Age Popularity Guide, chock full of advice about posture, making friends, skin care, and party-throwing. Even though the book was more than sixty years old when Maya got her hands on it, she decided to give it a try herself. See, Maya described her social position as “the Social Outcast group, the lowest level of people at school who aren’t paid to be there.” She figures a popularity guide is just what she needs-and so, the Great Betty Cornell Popularity Experiment was born. Every month, Maya tries a new challenge-from walking gracefully (“move the leg in one piece”, Cornell advises), to counteracting shyness (“It is important to remember that when you are shy it is possible for you to give people the impression that you are rude.” She wears pearls and stands up straight, and tries to include everyone in her conversations. Even though some of her schoolmates are mystified at her behavior, Maya finds that a lot of Betty Cornell’s advice still applies today! After her experiment, Maya wrote up this whole book, with her own Popularity Tips included. And the best part? Maya is a real life fifteen-year-old. So, all you teens out there-write your books! We’d love to read them! In the meantime, check this one out. I think you’ll love it.